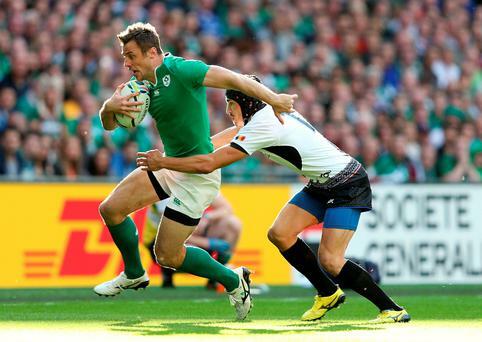 Ireland's Tommy Bowe during the Rugby World Cup match at Wembley Stadium, London. David Davies/PA Wire. An Ireland fan in the stands shows his support during the Rugby World Cup match at Wembley Stadium, London. David Davies/PA Wire. Ireland's Simon Zebo (centre) is tackled by Romania's Csaba Gal (left) and Viorel Lucaci (right) during the Rugby World Cup match at Wembley Stadium, London. David Davies/PA Wire. Ireland coach Joe Schmidt speaks to his players prior to the Rugby World Cup match at Wembley Stadium, London. David Davies/PA Wire. An Ireland fan prior to the Rugby World Cup match at Wembley Stadium, London. David Davies/PA Wire. A general view of the path to Wembley during the Rugby World Cup match at Wembley Stadium, London. David Davies/PA Wire. Ireland fans prior to the Rugby World Cup match at Wembley Stadium, London. David Davies/PA Wire. A general view of Wembley Stadium during the Rugby World Cup match at Wembley Stadium, London. David Davies/PA Wire. Ireland's Devin Toner (left) and Paul O'Connell at Wembley Stadium, London. Andrew Matthews/PA Wire.